You're psyched for a trip but something is...off. Give yourself permission to say 'no thanks' this time around. You’ve been planning a trip for a while now - maybe even for weeks or months. Your buddies are all psyched. You’ve double and triple checked your gear. Everything is packed and ready to go. Car is gassed up. But something’s not quite right. Maybe it’s that you’re still getting over that nasty cough from last week. Maybe you had a fight with your significant other and things still aren’t patched up. Maybe you tweaked your knee a few days ago at the gym and it doesn’t quite feel right. Or maybe it was something as simple as you slept horribly the night before. All of these are examples of personal distractions that will make you less present and possibly less aware during your hike, climb, paddle, or ski, and in the end, it could up being more of a liability. Whatever the case may be, these are all valid examples of reasons to say no to a trip, and there are hundreds - even thousands - of others out there. It is a tough decision to make, but one that has to be examined honestly for the sake of yourself and the group. Being aware of the issue is the first step in this decision making process. Another factor is the size, duration and demand (both physically and mentally) of your objective. Are you headed out for a leisurely paddle in calm water on a lake, or is this the start of a large, multi-day traverse with multiple technical objectives? If your mind is unable to focus on the challenges of your outing, maybe it’s a better idea that you put it off for a later date. 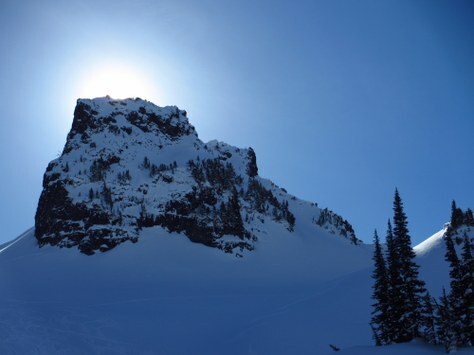 It can be a little easier if your objective is something here local in the Cascades, but what if it this is the start of a multi-day climbing trip a few states away or more? Will you be able to get over this personal distraction by the time you get to your destination, or will it linger with you? Another hurdle can be the sense of responsibility. You were the one who did all the planning for the trip, or maybe you were the most experienced person in the group. You were the one who was going to lead all of the hard pitches on the climb. Whatever the case may be, any of these can give you a feeling of failing your fellow teammates. But personally, I would rather have a partner who could be honest with me and who could trust me enough to tell me they weren’t ready to fully commit themselves to our objective. In some cases with a larger group, excusing yourself early can help save the trip for other members of the team. After an early morning start and a long drive to the trail head, a group starting hiking in to climb South Early Winters Spire. Part of the way through the approach hike, one of the students started to feel nauseous and could no longer continue. He had been sick throughout the past week and was still recovering. If this was a smaller group, the whole team may have needed to turn around. Luckily for this group, there were two other experienced climbers who could descend with the sick climber and it did not affect the rest of the climbing party’s day. However, if he would have made the choice ahead of time not to go on the climb, then the other two climbers would not have had to turn around and hike back out with him. Your partners are going to be more understanding of you more if you bow out early instead of waiting until you hike all the way in and get to the base of the climb before you decide to pull the plug - especially if you knew there was an issue already. I could go through tons of other scenarios here, but in the end there is no perfect rule of thumb. You have to look at your situation and be honest with yourself and your partners. You need to ask yourself, “How will this issue affect my ability to make good decisions?” But while asking yourself that, you also need to realize that you might not actually be making good decisions at that exact moment! So it can be a little bit of a paradox. Sometimes, simply talking with your partners about your concerns or issues will help you come to some sort of realization about the choice you need to make. Discussing the issues with your partners could help you realize that you need to say no, or maybe they can help you assuage your concerns and you can continue with the trip. But if you have a partner that shames or belittles or condemns you for having concerns, then I recommend finding a new partner (and that rings true for more than just climbing). I hope this has made you more aware of this often overlooked issue. We can easily get so emotionally wrapped up in achieving our goals, but it’s okay to sometimes say, “no” and put things off until a later day if you are not fully ready. Set aside your emotional attachment, discuss the issues with your partner, and try to make the best decision. The mountains, trails, and seas will be there for the next time, and until then - take care.